Srimanthudu is an ideal Independence Day gift with the ‘Ask not what the country has done…’ concept. Only, John F Kennedy, who uttered these memorable words decades ago, would be turning in his grave if he saw how Tollywood has added mirch, masala and then some salsa to make it into admittedly a delectable superstar movie. Srimanthudu was on shaky ground ever since Baahubali: The Beginning – the baap of all Indian movies – released a few weeks ago. Leave alone the high expectations from Tollywood to go beyond Baahubali, hero Mahesh Babu himself badly needed a hit after the comparitive disappointments of 1:Nenokkandine and Aagadu last year, Fortunately for Mahesh and director Koratala Siva, Srimanthudu is a clean and simple entertainer playing up well to its leading man’s strengths. Harsha (Mahesh Babu) is a rich, idealistic youth who falls in love with his classmate, Charusheela (Shruti Haasan). She introduces him to the power and joy of giving back something to society and family. Harsha consequently brushes aside his foreign education, rejects a cushy CEO job and moves to a small village called Devarakota. 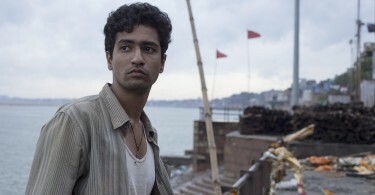 Harsha adopts the village, which has been wronged by his ambitious, billionaire father. How Harsha corrects the wrong of his father and gets the village to embrace him forms the crux of the movie. Even as the last few big movies in Tollywood have been about fighting for your country and kin while retaining good old ‘Indian’ values – Allu Arjun’s S/O Satyamurthy or Baahubali for instance, those who have watched Shah Rukh Khan’s Swades (2004) can’t but help but be reminded of the Hindi film while watching Srimanthudu. However, the movie has been nicely localized to suit Telugu sensibilities with good doses of romance, humor, action etc. Surprisingly, director Siva steers clear from mass and punch dialogues (which have been the hallmark of all Mahesh’s previous movies like Dookudu and Aagadu) and keeps it simple and sweet. In scenes where most other heroes would typically flare their nostrils and flex their arm muscles in anger, Mahesh Babu scores with an understated performance. While clearly the film is an out and out Mahesh Babu vehicle, the film does manage to give space to other characters in the village as well. However, the director could have avoided using the typical stereotypes (hapless villagers, big factory, polluted water) to portray a typical village. Shruti Haasan scores as the girl with a strong sense of social consciousness. Her dialogue ‘Give back to your village or else you will grow fat!’ has become so popular that ads and newspaper headlines have started quoting it! And above all, she looks absolutely gorgeous in the MJ-isque Charusheela song. Devi Sri Prasad’s music hits all the right notes with the Rama Rama song already a chartbuster. The cinematography by Madhie lifts the film a notch or two with some eye-pleasing visuals. However, in terms of editing and overall pacing, the film’s narrative flow, after a breezy enough first half, suffers somewhat from the relatively slow-paced second half and some obvious sugar-coated messages about homeland and community. Overall though, Srimanthudu breezes through like any good holiday-time Tollywood movie should. Nothing more. Nothing less.